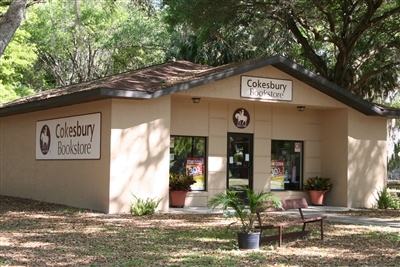 This Cokesbury store has been a mainstay at the Life Enrichment Center for nearly 20 years. FRUITLAND PARK – It has never been your run-of-the-mill bookstore. For example, where else can you find a life-size, ready-made crown of thorns, an assortment of chalices, an Amish cookbook and Bible camp in a box? Last week, those items shared shelf space with paperbacks, hardcover books, DVDs, clergy apparel, Christian greeting cards and more in the Cokesbury store at the Life Enrichment Center, a Florida Conference retreat facility. But not for much longer. The Cokesbury store, a mainstay at the center for almost 20 years, will close April 20. This week, the merchandise discount will go from 30 percent to 50 percent off. Doris and Harold Cotsamire of Ada, Ohio, were among those taking advantage of discounts last week, but that didn't mean they were happy to see the "store closing" signs. "We always have to come here," Doris Cotsamire said of the couple's visits to the LEC. "It's one of my favorite spots." The Cokesbury store at the LEC is among nearly 60 across the country that are shutting their doors for good as The United Methodist Publishing House moves its storefront almost exclusively to the Web. About half of the stores had closed by mid-March. Cokesbury manager Dawn Hood packs up some merchandise to ship back to The United Methodist Publishing House as she prepares the LEC outlet for closing April 20. The shift in sales approach tracks a similar trend in secular books-and-mortar bookstores across the U.S. The growth of Internet sales has outpaced revenues in traditional shops and made such outlets expensive to maintain. 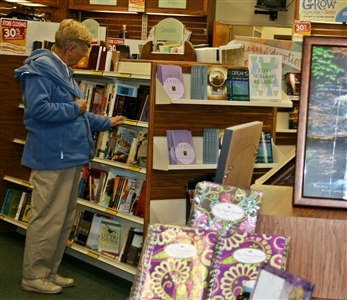 Overall, sales have dropped 50 percent at Cokesbury's traditional bookstores in the last 10 years, said Amy Campbell Smith, spokesperson for The United Methodist Publishing House, which operates Cokesbury stores. "We are a ministry of the church that receives no funds to support operations other than what we earn through sales, and the sum of all local stores' revenue has not covered store expenses," Smith said in an email. The publisher will try to replace some of the Cokesbury store experience with traveling exhibits. In Florida, community resource consultants in Tampa and Jacksonville will work with churches and seminaries to provide opportunities for customers to see and touch merchandise before buying, Smith said. Already planned are Cokesbury booths for the Large Church Initiative, scheduled for April 22-24 at Hyde Park UMC, Tampa, and for Annual Conference, June 13-15, in Lakeland. Dawn Hood has minded the Cokesbury store for three years. She finds it hard to see the growing number of empty shelves as the inventory shrinks without replenishment. "It's sad," she said. "The closer it [closing] gets, the harder it hits." What do you think about Cokesbury stores closing? Tell us in the comment section below. The store draws on participants at the LEC's various retreats for its customer base but also serves several local churches that place orders for such religious mainstays as communion wafers, confirmation books and church planners. "We have a lot of foot traffic too," Hood said, adding that many who stay at the retreat make it a point to visit the store. "We sell a lot of gifts: Mother's Day, Father's Day, First Communion, confirmation," she said. "We cater to all denominations, so we carry everything from Catholic resources to Wesleyan books." The daughter of a Church of God pastor, Hood said she thought she was well-versed in all things Christian until she started working at Cokesbury. "I've learned so much from being at this bookstore," she said. 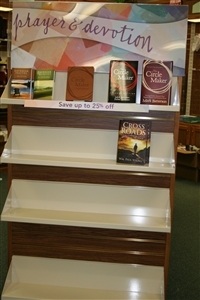 Some shelves are going bare as Cokesbury at the Life Enrichment Center prepares to close. She also has come to recognize familiar faces, particularly among the winter visitors who stop in at the LEC every year. Usually, they take time to chat and share stories of their families as they make their purchases. Hood has become accustomed to saying, "See you next year," when they leave. For her, not being able to say that has been one of the hardest parts of closing the store. "This time it's like they're saying good-bye, and it's permanent." When Cokesbury built the store in 1993, it agreed to give the property to the Florida Conference if its operations ceased, said Rev. Jess Schload, LEC director. He said the building will become a much-needed meeting hall. To access the Cokesbury online store, click here. For other ordering options or information, call 1-800-672-1789.